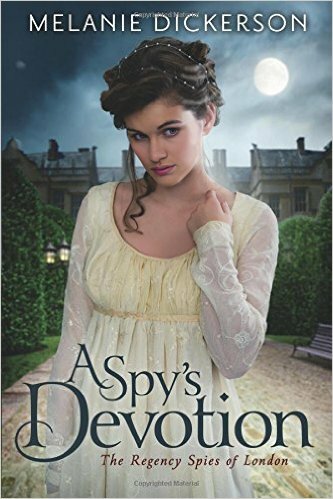 A Regency era Jane Austen style story with suspense and intrigue. A must read for anyone who likes a good, well written spy story set during this time period. This is my favourite genre and where I was disappointed with Erica Monroe's foray into the genre last year, where the spying didn't get much further than the blurb, I am very enthusiastic about this new series by Melanie Dickerson. It certainly doesn't disappoint. The characters have an actual mission to complete, there is a real sense of suspense and danger and the romantic element doesn't take over the story. I liked that Julia doesn't get romantically involved with Langdon too early in the novel. She fights her attraction for much of the story out of loyalty to her spoilt cousin who is determined to marry him. Despite this, their romantic journey is romantic and sweet and at times humorous. I enjoyed the the more menacing characters as well. Julia's uncle was suitably horrible to her and added to the overall feeling of how oppressive her life was becoming under her guardian's care. Julia is a lovely character; kind and full of spark. She handles herself well in sticky situations and tries to resolve things herself rather than waiting around on a man to rescue her. Langdon is a typical English gentleman. He is bit tight lipped about his feelings as he isn't ready to marry. I loved that in his attempts to avoid encouraging romantic aspirations in young women he makes sure to dance once with every girl and never twice with anyone. A rule he is sure to break with Julia. I absolutely loved this book and couldn't put it down. The rest of the series is going on my pre-order/ auto buy list.